“…Continuum…”, like a development with no interruptions, where space and time get combined. “…Continuum…”, like something intangible, between the appearance to the presence and the persistence of a hidden and nearly secret life. “…Continuum…”, like the awareness of the “continuity” of a tradition, the tradition of painting which doesn’t necessarily have to be new or amazing. Through the name “…Continuum…”, Raffaele Cioffi identifies his recent work and pinpoints a trait of his art emphasized in his paintings produced between 2003 and 2005. In the last page of the catalogue describing his personal exhibition held in Chiostro di Voltorre in 2003, there was a painting whose title referred to the following year (Continuum 2004) and that metaphorically opened or announced this new set of art works, by anticipating a link to the new phase of his production. So, maybe considering the new phase now accomplished, he feels the need to place a new word or a new image to conclude a speech developed through a remarkable number of art works, of several dimensions and different features. What is the difference between these paintings and the ones coming immediately before? There’s above all a different conception of the internal movement: this was previously interrupted, broken, based on the appearance of elements of a sudden opening as it was in the set of works called “Prospettive Interiori” (Internal Perspectives); the movement turns then to an absence of solutions of “continuity”, basically open beyond the bounds of the canvas, based on a strong sensation of bi-dimensionality. Maybe the margin is not extremely pronounced, as the background aims to give a sensation of space-time created inside the painting and on the surface, by keeping trace of the intervention both on light and colour, where the “abstraction” is an internal and intimate dimension of the pictorial gesture, completely expressed through the immediate appearance of its instruments. In his letter-style text, addressed to Cioffi in occasion of his exhibition in 2003, Marco Meneguzzo rightly pointed out how “interesting” was Cioffi’s attempt “…’to heal’ Fontana’s cuts”. This may be the starting point to consider once again what kind of space-time arises from Cioffi’s art and therefore from his recent works, which come back to this theme not in an explorative or intuitive way but through the repetition of the daily practice. 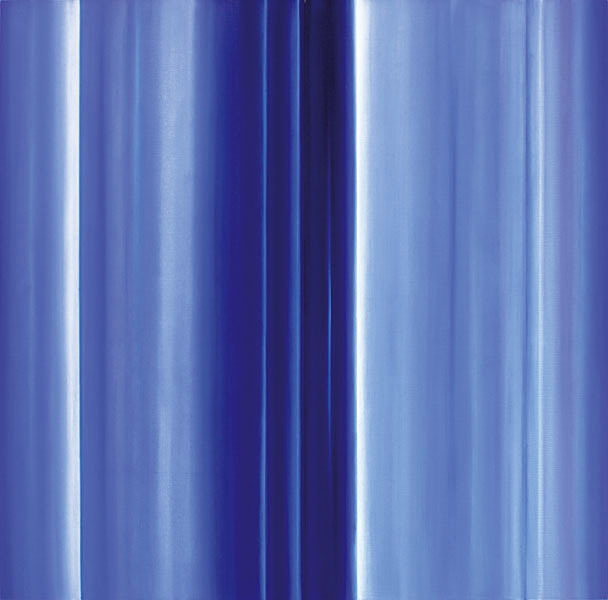 Whereas some light blades, appeared in the previous canvas in the so-called “Prospettive Interiori” (Internal Perspectives) cycle, seemed to refer precisely to Fontana’s cuts, by nearly ruling out the essential assumption – to be an example of Another space of the canvas, or the canvas constituting a visual and palpable fragment of it – the absorption of vertical signs, modulating the light inside the chromatic sequence of this other set of art works, takes for granted the complete “return to the canvas” as to that model. Actually Cioffi never gave up his painting and his instruments; he obstinately defended them but he couldn’t avoid to compare himself to those who conceived the painting as an introduction to other experiences, based on the space itself. Going back to the canvas as a metaphorical space could therefore seem reductive but it denotes an attempt to find further reasons in it, defining themselves through painting explained as purpose in itself and moreover to its representative form. Healing Fontana’s cuts could mean to seek refuge inside the painting, no more conceived as a creation ground; nevertheless without looking for a challenge with different ways in order to go beyond the visual dimension of the object-painting. Cioffi implicitly goes ahead into the spatial and temporal dimensions of the “continuity” denoting his way of learning something out of that lesson, without feeling dependent or being conquered by the revolutionary or millenarian side of the prophecy of a space-time unity obtained through scientific researches or technological innovations. Far away from the synthesis between artistic and scientific languages made by Fontana, the space-time “continuum” recalled by Cioffi concerns the canvas surface, with no allusion to a space of depth or of perspective but basically conceived as vertical gesture on a horizontal development: this process comes back to some procedures used by Cioffi for the first time in some paintings of large dimensions in the first half of the 90’s – “Intorno al Blu” (Around Blue) – for which Cerritelli explained how “Cioffi deeply loves also the dilatation that can suggest the horizontal dimension, that means the colour’s relax, the prolonged extension of the view to light fields that conceal and reveal underlying visions…” (C. Cerritelli, Il volto dell’anima, in Raffaele Cioffi, Bollate, 2001, p. 21). As taught by the history of painting of the latest decades, bi-dimensionality develops itself, through this methodical insistence, on a strong verticality that affirms the “presence” of the light-colour zone in the boundless dimension, without the need to create or define the shape. On the other hand, geometry is absent, virtually torn out of Cioffi’s recent works, as it could interrupt the sense of space-time continuity to which this cycle belongs. In order to further qualify his works, in addition to the variation of changing colours, of the bright shades which match through harmony or barely through contrast, the artist resorts a strategy ever used by painting and looks for a balance between sections, not necessarily for a narrative aim: that is the strategy of composing diptyches and polypytches, by strenghtening the chromatic changes, by allowing to find a harmony between two, three or even several sections drawn near in continuity, combined by either finished or left open rhytmic stresses. Overall, in his recent larger size paintings, it seems as if the starting point and the finish point, from left to right or vice versa, would express an internal logic, even though one may think it’s an unaccomplished path that could move towards endlessness. The short white or light pauses seem to recall once again those true blades of the previous works but now they totally belong to the surface, completely absorbed in an unitary development. During this working phase of Cioffi the elimination of every diagonal sign or element different from the verticality reduces and almost deletes the dynamism and the sense of an internal movement. Everything breathes in a sort of a repetitive continuity which aims to calmness or to stillness, even though this couldn’t really take place, as it occurs in several assumptions of monochrome. Therefore, compared to other forms of the absolute or “analytical” painting, the speech acquires, in a weaker way, some philosophical or mental qualities, as Cioffi is interested in the visible trait more than all the argumentation about it, as described by Claudio Cerritelli in the most exacting text about this young artist’s work. His painting is sensitive and refers first of all to senses, based on visual qualities touching perceptive features, through his natural bent to gather the quality and the presence of the colour that coincides with space. In a group of his recent works, he dares to recall some visual and chromatic qualities of the four seasons, maybe through a rather simple characterisation with cold and warm colours differently mixed; but in many other occasions, this kind of didactic estimation of the tone and of the colour is not so immediate, rather showing, in some of the most exacting and independent paintings of his latest work, internal contrasts which produce a visual blow based on a sense of breaking off or rather suggesting a dialogue whose tones are tense like notes of a bold musical composition. Brightness and evidence of the practice on the colour brought to its immediate surface quality denote an attitude far from the usual risk of decorativism or that of repetition exactly because, in the same way, further possibilities arise, breaks of the rhytm that bring out a sense of continuity rather than denying it. According to a somehow classic research of measure, through these works Cioffi denotes the relationship with a valid and rooted tradition of a solid and completed abstraction. Rather than going towards experimental assumptions and being aware of his forming, after devoting his time and energy to this journey inside a colour with no dimensions, Cioffi maybe feels the need to come back to the structures and the consistence of a form, to its shadow, to its dullness, in order to find further metaphores to build a coherent pictorical architecture, even if it is unpredictable and subject to inevitabile openings and changes.